I’ll happily argue that Gremlins, L. A. Confidential, Lethal Weapon, and The Apartment are more Christmassy films than The Bells of St. Mary’s. 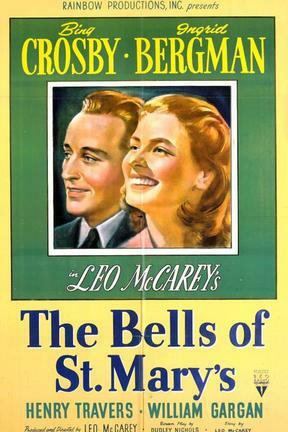 The former films quite explicitly take place at Christmas time, while The Bells of St. Mary’s happens to have a scene where a Chrsitmas play is rehearsed. That scene is in the middle of the film, a story that takes place over an entire school year. Nevertheless, the film is in the rotation of Christmas films, and it has a place on top Christmas film lists. A version of the film’s theme (the St. Mary’s school song) can be found on Christmas albums. When George Bailey runs through the streets of Bedford Falls on Christmas Eve in It’s a Wonderful Life, we can see that The Bells of St. Mary’s is playing at the local movie theater, because the title’s up on the marquee. So I figure all this is good enough to give the film a place in Movie Churches’ Christmas films, and it certainly has a church and clergy -- and a little bit of Christmas. The film is a sequel to Bing Crosby’s hit, Going My Way, which won an Oscar for Best Picture. In The Bells of St. Mary’s, Bing again plays Father O’Malley, the good natured priest, this time going to serve in a parochial school run by nuns led by Sister Superior, Mary Benedict (Ingrid Bergman). 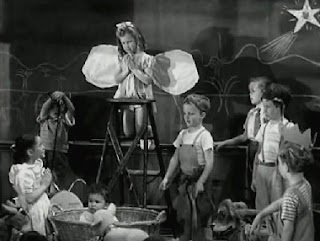 The film follows a school year, and in the midst of that school year, there is a rehearsal for a Christmas play. There is a shot of St. Mary’s covered in snow and we see Father O’Malley playing “Come All Ye Faithful” on the piano as he sings in Latin, surrounded by a group of students. Sister Mary Benedict comes in and complains that the noise is interrupting the kindergarten’s rehearsal for the Christmas program. Bing offers to play for the Christmas program, saying, “You can’t have a Christmas play without ‘O Holy Night’ or ‘Adeste Fideles’.” But Sister Mary Benedict tells him the kids have the program covered. They say, “No” and are sent away until someone finally offers the stable. 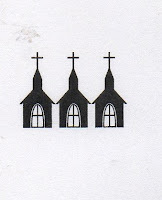 I should note that the Christmas story presented in church Christmas plays and Christmas cards is off. We always see Mary and Joseph traveling to Bethlehem alone, but people in that day usually travelled in groups. All of Joseph’s family were required to report to Bethlehem for the census, so they probably traveled with family, not alone. The little kids in the movie take things a litttle further from the true story when the innkeepers reject Mary and Joseph because they have no money -- that’s not in Scripture. (Perhaps it’s a juvenile attack on capitalism.) But their play is darn cute. 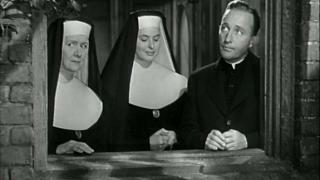 But we need to remember that the purpose of Movie Churches is to examine ministries in films, so how they do Father O’Malley and Sister Benedict do? Let’s just say some of the practices at the school are...problematic. One of the odd things about their work with the kids shows ups when we see Father O’Malley taking a special interest in one of the girls in the school, and Sister Benedict is a special supporter of one of the boys. When two school boys fight, Father O’Malley expresses his admiration for the boy who beats up a kid named Tommy, saying, “That boy knows how to handle himself.” Tommy had been trying to practice the teachings of Jesus (turning the other cheek) that he’s learned from Sister Benedict. When she sees that her instruction led to Tommy beaten up, she decides to teach him to fight. She gets a book by boxer Gene Tunney and schools Tommy in the pugilistic arts -- because obviously that guy Jesus didn’t know what he was talking about in the Sermon on the Mount. Father O’Malley takes an interest in a thirteen-year old girl named Patsy. Patsy’s parents have been separated since the girl was two (but not divorced, because that wouldn’t be the Catholic thing to do). When O’Malley is asked about the girl’s situation, he tries to fudge over the facts for fear the girl won’t be admitted. But she is. She comes to O’Malley for help with her school work, which he provides by teaching her songs. 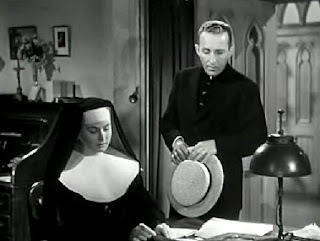 When Patsy fails the test for eighth grade graduation (intentionally, we later learn), Father O’Malley encourages Sister Benedict to overlook the test scores. The Sister insists the school must maintain standards, but Father O’Malley seems to believe kids should be graduated without regard to their academic performance. He seems to think this is the compassionate thing to do, but I’m not convinced it’s a good idea to move kids through the system whether they’ve learned or not. 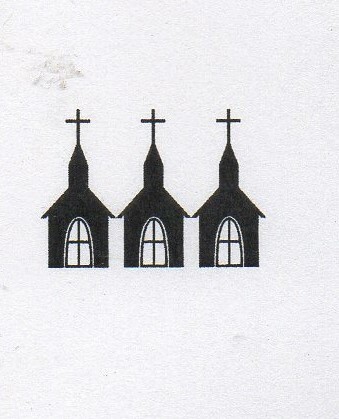 The main plot of the film, as with many movies about churches made in this period, is about finances and real estate. St. Mary’s is supposedly in ill repair and could be condemned at any time, though the viewer is shown no evidence of this. Sister Benedict is covetous of the new office building next door to the school built by Horace P. Bogardus (Henry Travers). Obviously, he is greedy for wanting to keep the building he made for his business instead of giving it to the Church for the school’s use. Sister Benedict makes it her prayer project that Horace will give the building to them. She doesn’t talk about praying for Horace’s salvation or for him to be blessed, but that he’d give her the building. At the end of the film, there is a health crisis causing Father O’Malley to struggle to decide if honesty is the best policy. Sister Benedict must deal with her own issue of bitterness, and their problems are resolved in a godly manner. 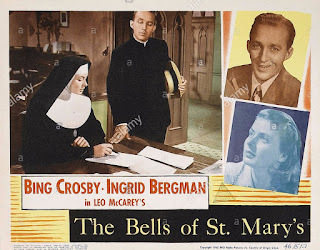 So in the Spirit of Christmas (even though there isn’t much Christmas in the film), I give the pastor and the nuns of The Bells of St. Mary’s Three Steeples.